Stunning curves meet full-immersion bathing in the Soho 5 ft. Centre Drain Soaking Tub in White. Contemporary styling and soft lines contribute to the freestanding tub's modern aesthetic, sure to enrich your bathroom ambience and add a hint of serenity. The acrylic construction is strong, light and warmer to the touch than typical steel or enamel tubs, allowing for easy installs and heat-retaining soaks. Overflow and drain outlets in brushed nickel are included to complete the setup of this elegant oval bathtub. Perfect for deep soaking, the Emily 5.75 ft. Centre Drain Soaking Tub in White is deeper than standard tubs for full immersion and supreme relaxation. Contemporary styling and clean lines contribute to the freestanding bathtub's modern aesthetic, sure to enrich your bathroom ambience and add a hint of serenity. The acrylic construction is strong, light and warmer to the touch than typical enamel or steel tubs, allowing for easy installs and heat-retaining soaks. Overflow and drain outlets in a brushed nickel finish are included to complete the setup. Full-sized, full-immersion soaking is yours with the Mermaid 5.92 ft. Centre Drain Soaking Tub in White. A chic rounded design and bright white finish produce a dramatic effect on this freestanding bathtub, sure to enrich your bathroom ambience and leave a lasting impression. The acrylic construction is strong, light and warmer to the touch than typical steel or enamel tubs, allowing for easy installs and heat-retaining soaks. Overflow and drain outlets in a brushed nickel finish are included to complete the setup. Soho 5 ft. Centre Drain Soaking Tub in White Stunning curves meet full-immersion bathing in the Soho 5 ft. Centre Drain Soaking Tub in White. Contemporary styling and soft lines contribute to the freestanding tub's modern aesthetic, sure to enrich your bathroom ambience and add a hint of serenity. The acrylic construction is strong, light and warmer to the touch than typical steel or enamel tubs, allowing for easy installs and heat-retaining soaks. Overflow and drain outlets in brushed nickel are included to complete the setup of this elegant oval bathtub. 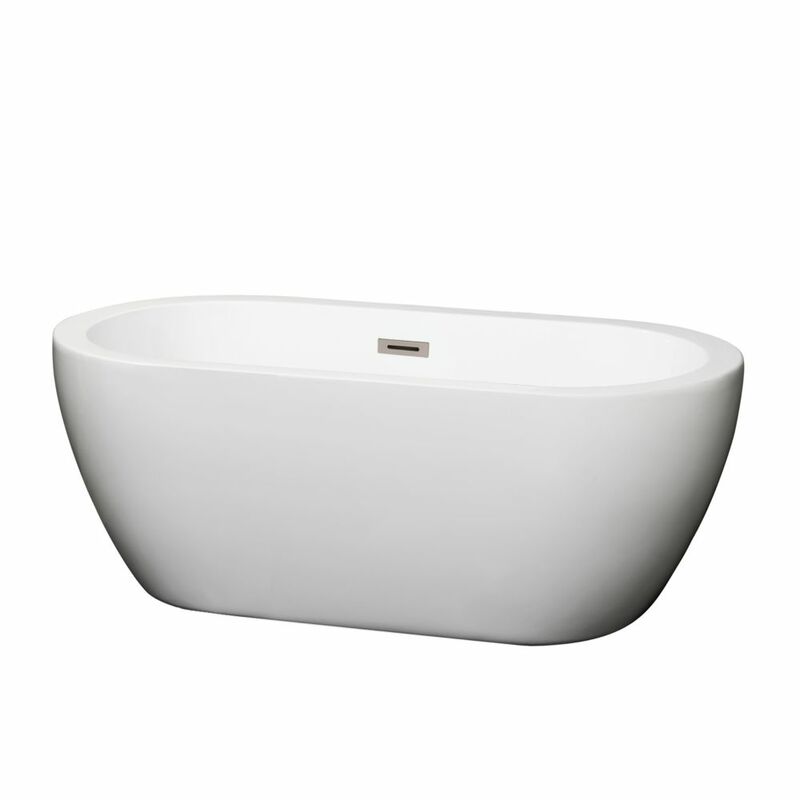 Soho 5 ft. Centre Drain Soaking Tub in White is rated 4.8 out of 5 by 4. Rated 5 out of 5 by MrsJ from I love this tub. It fits in my bathroom, yet is large enough for me to enjoy a long soak. And the... I love this tub. It fits in my bathroom, yet is large enough for me to enjoy a long soak. And the water stays hot, which surprises me because the water cooled quicker in my old garden tub. My contractor installed it so I dont know how difficult it was, but he did a great job. Rated 5 out of 5 by Shelley from It’s the perfect size without sliding under! It’s a great... It’s the perfect size without sliding under! It’s a great height for resting my arms on the outside. It has a nice water depth and it’s stable. My only little gripe is the drain. It’s kind of funky in that it pops up and sometimes out but it won’t go down on it’s own…I have to push it down. But it could be the installation. I just had my Master bathroom remodeled and I knew I wanted a freestanding tub. This is PERFECT and I AM ON LOVE WITH THIS TUB!!! I tried to upload an image but nothing happened. Sorry! Rated 4 out of 5 by Homer from Great tub Tub is made of composite material and is much lighter than I anticipated. Drain assembly requires access from below however. Finished tub with our new tile looks like a magazine picture! Rated 5 out of 5 by Patty from I love it! Look beautiful,clean I love it! Perfect for a small person like me! The price is right . I am so happy! Have to be install for a professional if the person don't know how to do it. What is the difference between the model ending in BNTRIM and the model without this suffix?